All Leclerc looms and accessories are guaranted for one year, covering material and workmanship, and parts are replaced free of charge upon proof of defect. All Leclerc looms are made of selected, well-seasoned, kiln dried Canadian maple, except for the harness frames and a few parts that require a lighter wood. The metal pieces are of aluminium dye cast, cast iron and steel protected by metal enamel or plating. Looms are pre-packed with their equipment. All loom are shipped partially knocked down for easier handling. But assembly is simple and instruction are included. On all Leclerc looms, the tie-up system is very simple. Nylon cords insure years of service. 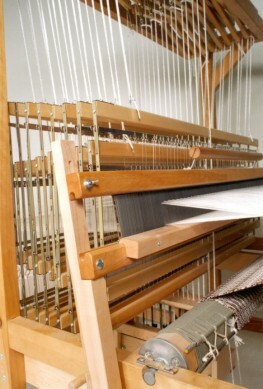 All floor looms have non-sliding polyvinyl pads under the uprights. The looms always have two treadles more than the number of harness frames. A weaving book, giving basic techniques and important information is supplied with each loom. Your Leclerc dealer can help you in choosing your equipment and will insure you an after sale service.